Taking a page from design integrators, consultants, educators, architects and interior designers, SOLICOR-CR™ was developed and Introduced as a Color-Through-the-Core, lab-grade work station surface solution perfectly suited for both horizontal and vertical applications in environments where chemical resistance, durability and aesthetics are top priorities. SOLICOR-CR™ Compact Solid Phenolic is a specialty Lab Grade material created with a solid color core that lets you design visually crisp and stunning spaces by eliminating the disruptive brown or black core line at the exposed edges. 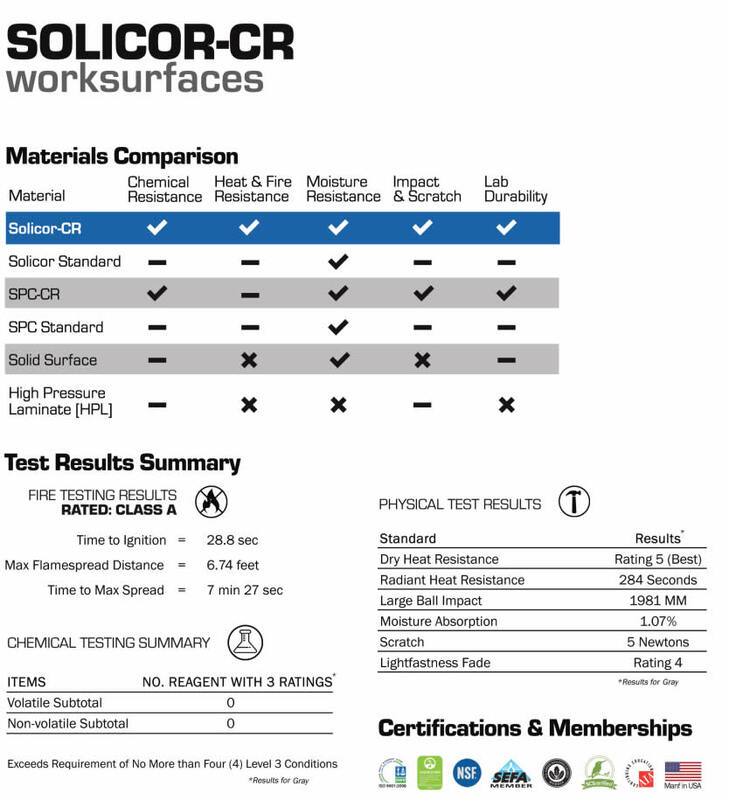 Solicor-CR™ is a Laboratory Grade material, chemical resistant, Color-Though-the-Core lab work surface. 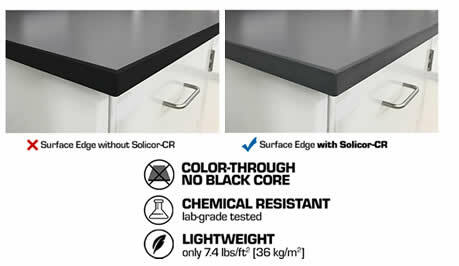 Equally stain-resistant and durable as other Lab grade Solid Phenolics, SOLICOR-CR™ is available in popular solid core colors of Graphite Grey and Light Grey and of course, Black core / Black surface, featured in matte surface finishes. "Designers want the freedom to use a durable and sustainable material like Solid Phenolic Color thru Core without sacrificing on style. By eliminating that disruptive brown or black line core, SOLICOR-CR™ opens up a world of possibilities." SOLICOR-CR™ Solid Phenolic Compact is a distinctive surfacing material composed of decorative papers impregnated with melamine resins and pressed over a colored decor paper core impregnated with special thermosetting resins to achieve an overall thickness. These sheets are then bonded at extreme pressures and high temperatures similar to all SPC Compact materials, to form the composite panels. Horizontal - Laboratory worktops, student and instructor demonstration desks, reagent shelving, mobile lab stations, food prep or food courts (Food Safe / Anti-Bacterial), waste water treatment plants, dental and medical facilities, opening up a new world of possibilities for lab design by providing a modern alternative for almost every surface in a workspace. This includes laboratories at the K-12 and university education levels, charter schools, research & development facilities for the government, medical and pharmaceutical industries, and other segments such as healthcare, hospitality and retail. Vertical - Shelving, partitions, cabinetry, wainscoting and more. In addition, SOLICOR-CR™ can be used without a substrate for countertops of thicker materials (3/4" & 1"), furniture, fixtures, partitions, lockers and wall panels. SOLICOR-CR™ Solid Phenolic Compact (SPC) is featured in a matte finish, and available in 3/8", 1/2", 3/4" and 1" thickness +/- 0.005" thickness. All other sheet sizes are considered factory order with longer production lead times. Design is in the details. From the smallest accessories to the biggest style choices, it's the details that add dimension and depth, creating dramatic spaces that impress from counter to counter and everything in between. The continuous color of SOLICOR-CR™ allows architects and consultants the freedom to design and create. 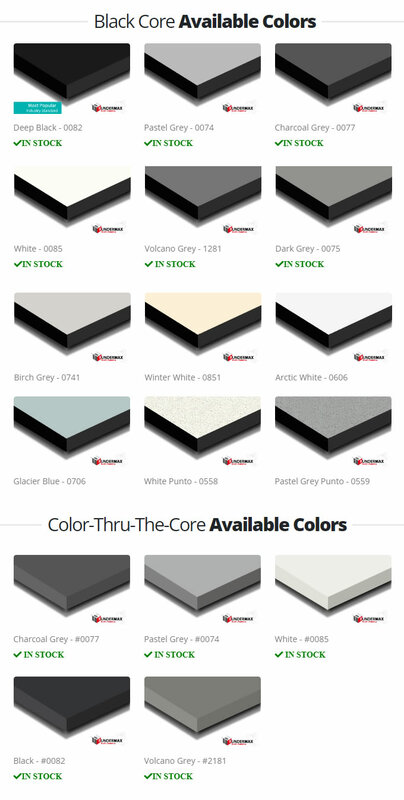 The innovative Solicor-CR™ was developed in conjunction with the request from architects and lab planners / consultants and designers to provide what they have long requested - a lighter weight, easy to fabricate, chemical resistant work surface that is the same color the entire way through the core. 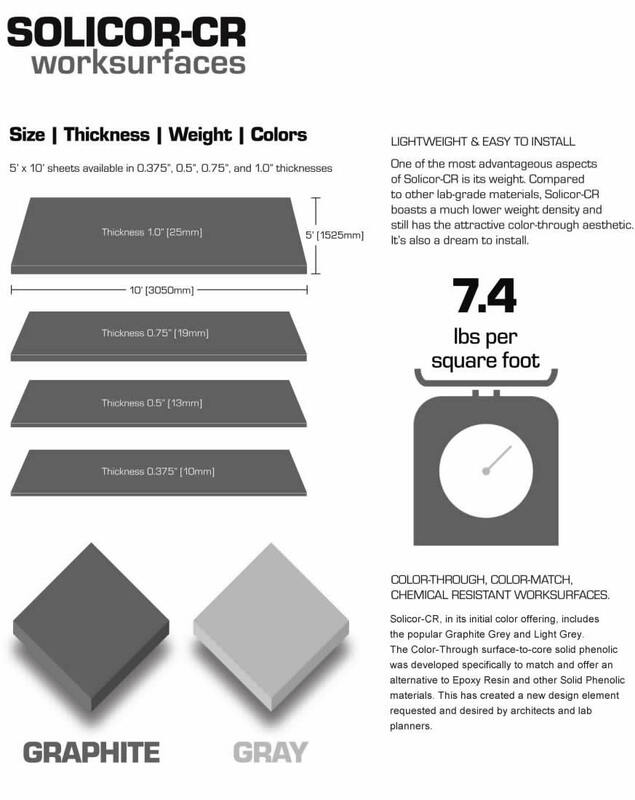 Best of all, the debut colors for Solicor-CR™ were created to specifically color-match two of the most popular Epoxy Resin options - Graphite & Gray Epoxy. Black surface and Core is also available and remains the industry standard.